I had a comment asking for the specific Kanom Krok recipe that I cooked in my previous post so as I was cooking them again I thought I'd take specific notes and post them for anyone else who was interested. I reckon this morning's effort was even better! I used corn this time as a topping as I didn't have any spring onions. 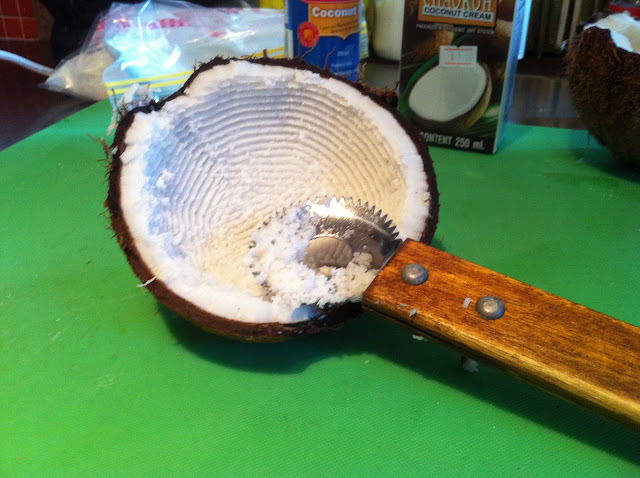 Other than the Kanom Krok pan you will also need something to crack the coconut with (I use a cleaver) and also something to scrape the coconut flesh out from the coconut (I used the scraper pictures below), metal chinese soup spoons also come in handy. 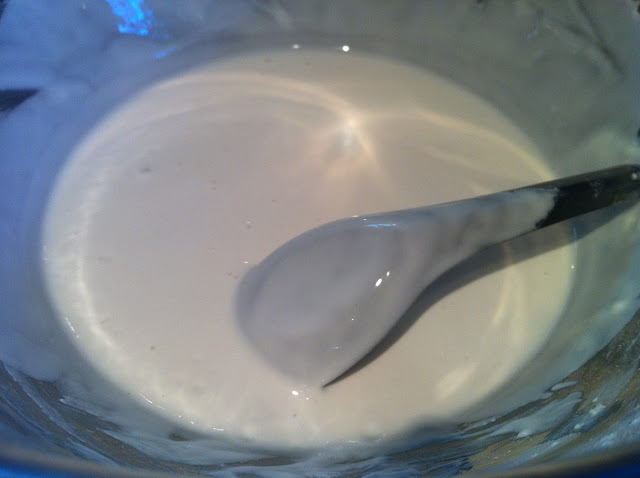 Make the batter first by mixing 1 tsp of the limestone paste with 1 cup of boiled water until dissolved. Leave this to settle and then pour off the limestone paste water mix and leave the residue in the bowl. you should get about 3/4 of a cup. 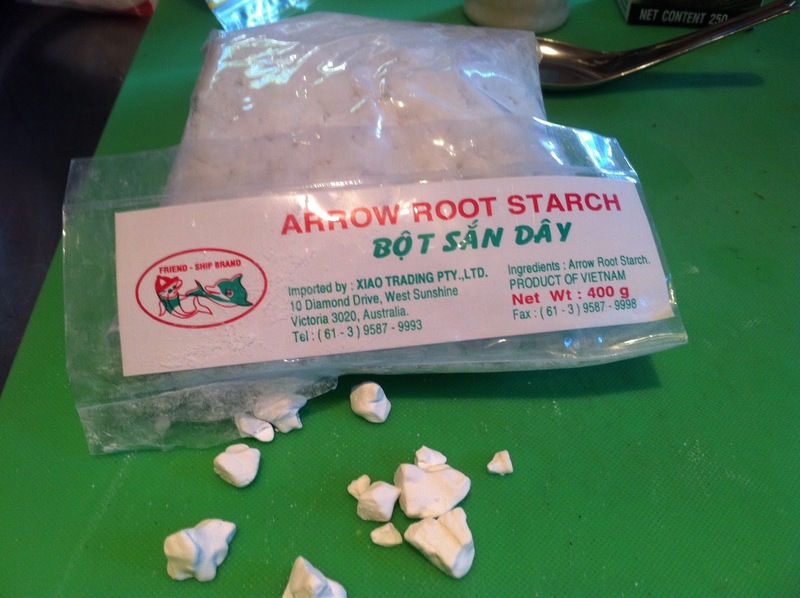 Next mix 1 tsp of arrowroot flour (you may need to crush this to a powder) with 1 cup of rice flour and 1/2 cup of water. 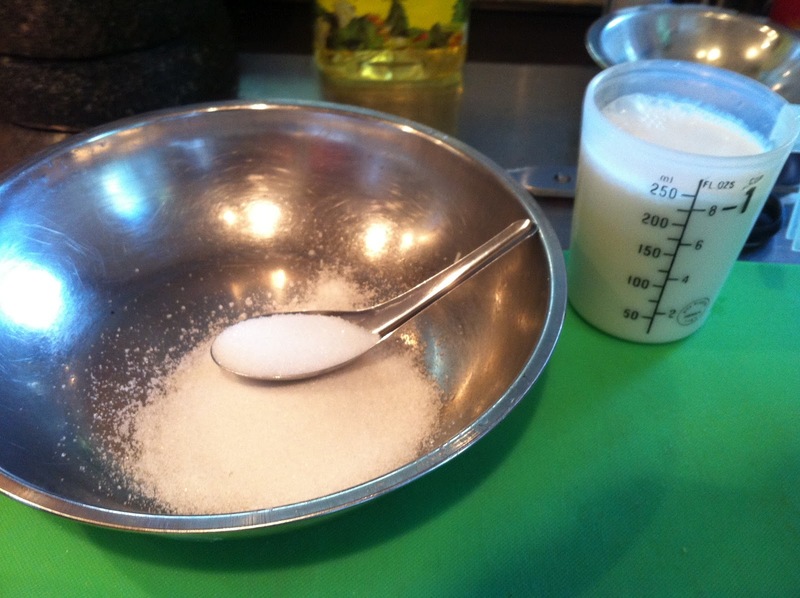 The batter should coat the back of a spoon with a thin film. David Thompson suggests that that should be left overnight but I don't worry about that. 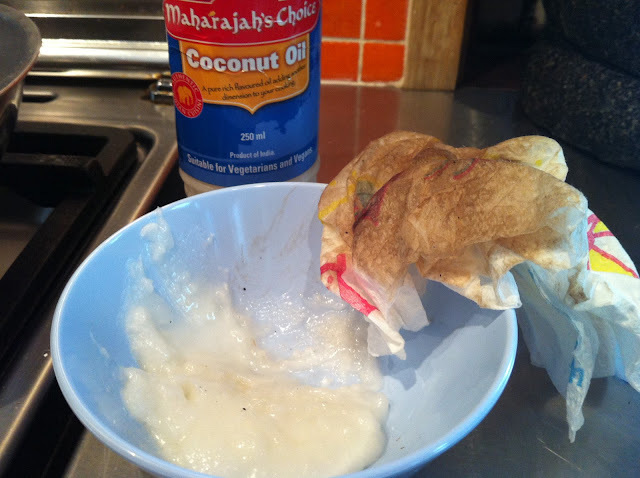 Next you need to add 1/2 cup of scraped coconut, 1/4 cup of cooked jasmine rice, 3/4 cup of the limestone paste water, 2 tbs of coconut milk (I used Chaokoh this time and it was OK but not as creamy as Kara) and 1/4 tsp of salt to a blender and blend to a smooth consistency. 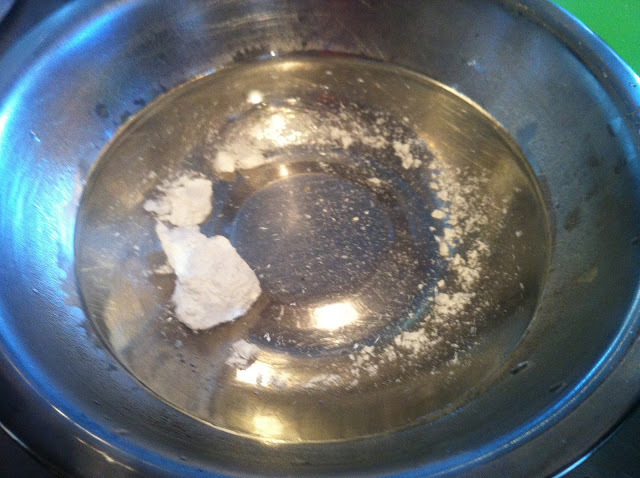 If you get any lumps it will stick to the pan so make sure it is nice and smooth. 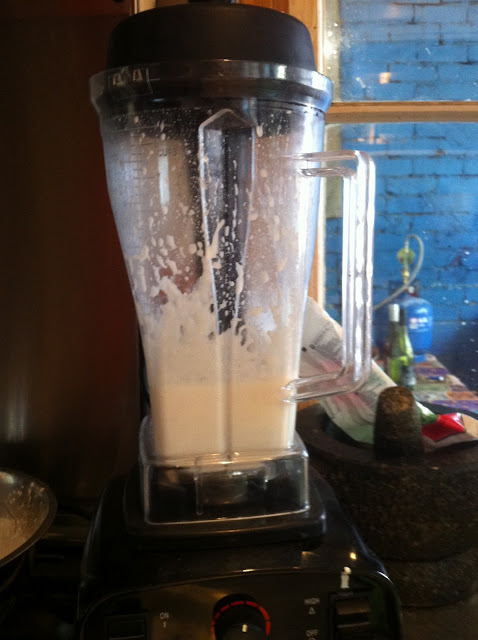 Once it is blended smooth add it to the rice flour batter mix and set aside. 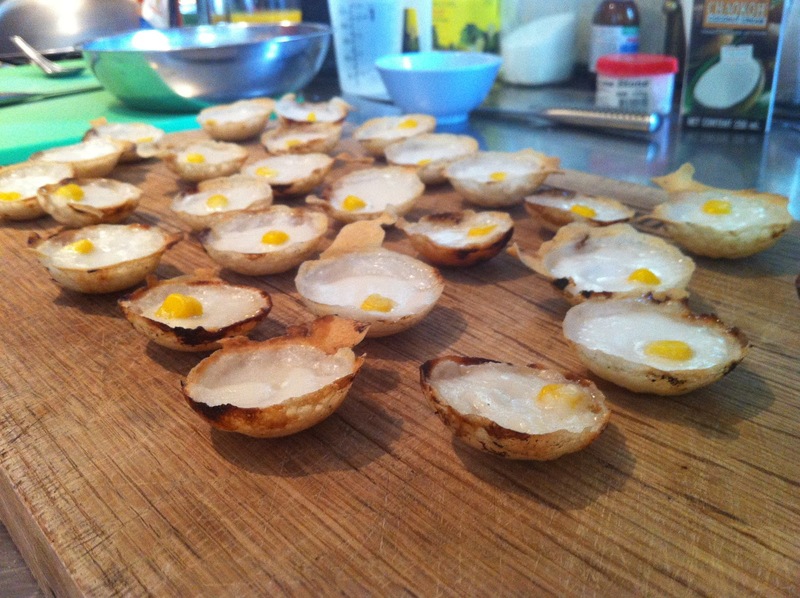 It is easier to make the Kanom Krok if you put this is a jug or container that is easy to pour from. 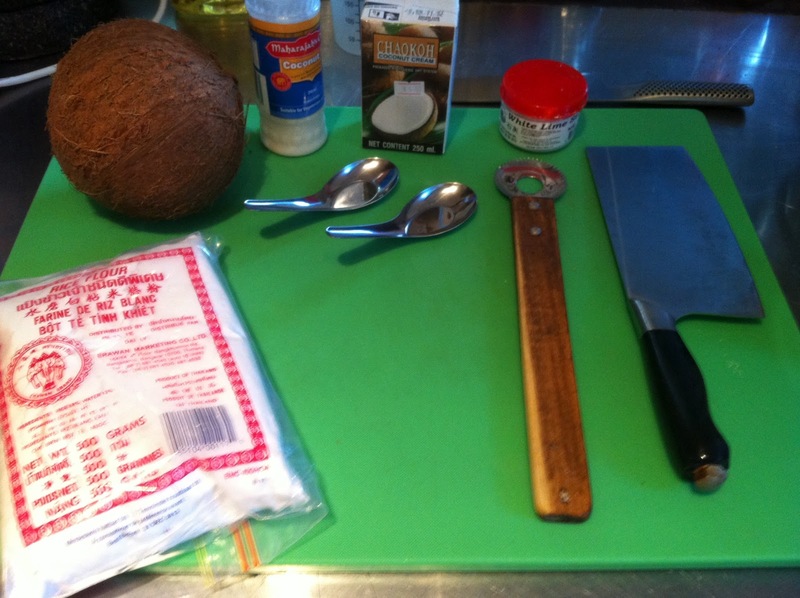 To make the filling add 1 cup of coconut milk, 1/4 tsp of salt and 4 tbs of sugar and mix until the sugar is dissolved. Now you're ready to cook! 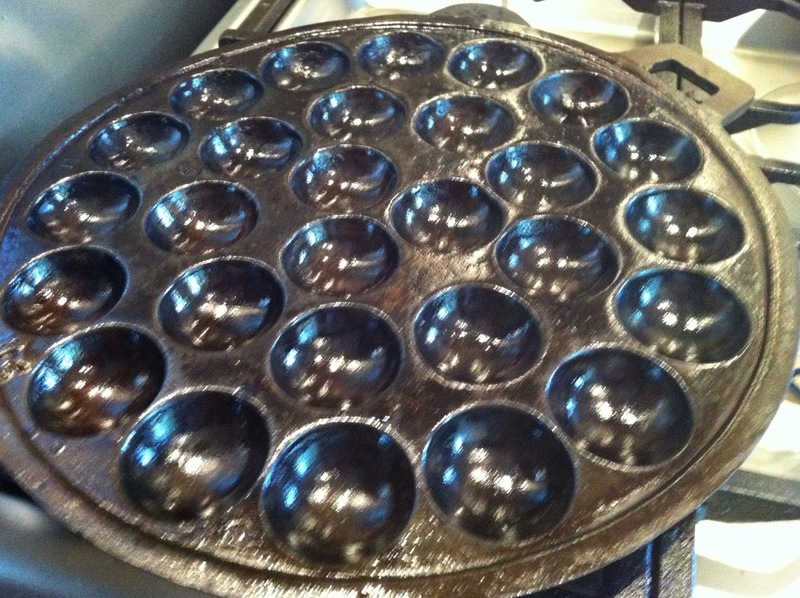 Put the Kanom Krok pan over a high heat using a heat diffuser so that the pan doesn't get direct heat and grease all the holes well with coconut oil. The coconut oil doesn't have a traditional oil consistency, its more like a white paste but it liquifies as soon as it hits some heat. Reduce the heat to medium and half fill each hole with the batter mix and lift and tilt the pan to ensure that the batter covers right up to the edges of each hole. Don't worry if it spills over a bit, this just forms delicious extra crispy edges. Cover and cook for 2-3 minutes. My pan didn't come with a cover but my wok lid fits perfectly! Next add about 1 tbs of the filling to each mould then cover and cook for another 3 minutes. You should notice the filling start to set and the edges start to brown. 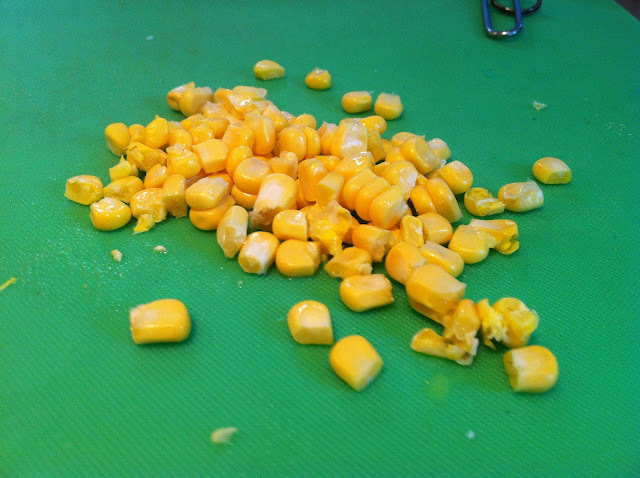 Finally add the corn kernels (or sliced spring onion) topping to each mould and cover and cook for another 5 minutes. Make sure you check every few minutes so they don't burn. I use a sharp pointed knife and a metal chinese soup spoon to gently lift the Kanom Krok so I can check that the edges are browning nicely. If they are hard to remove from the mould then either the batter is too lumpy or they aren't cooked enough, probably the latter. You definitely want them to cook until the edges are browned or the final result won't be crispy which is pretty important if you ask me. 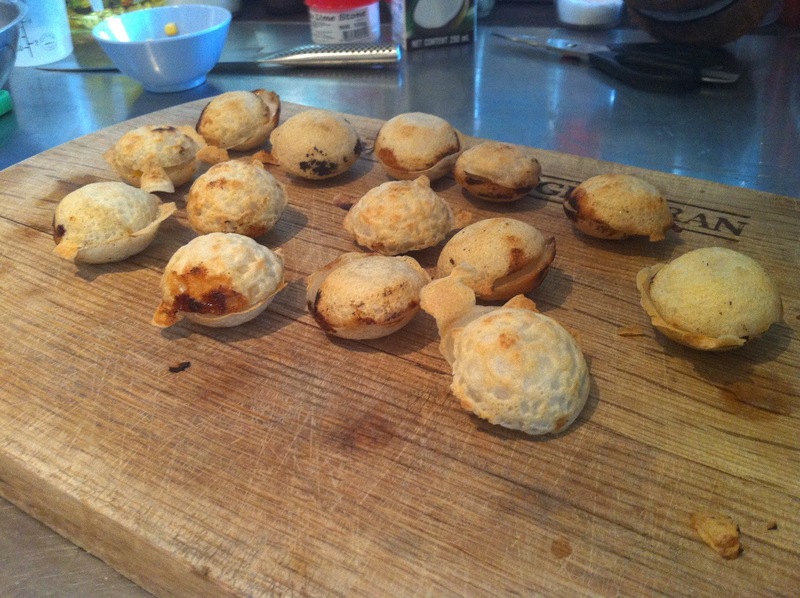 Once you are happy that they are all cooked to a delicious crispiness (the filling will also have set slightly but will still be slightly runny inside) remove them from the pan and place them face to face on top of each other. As you are removing them check by gently squeezing them that they are firm and not squishy, otherwise return them to the pan for a bit longer. 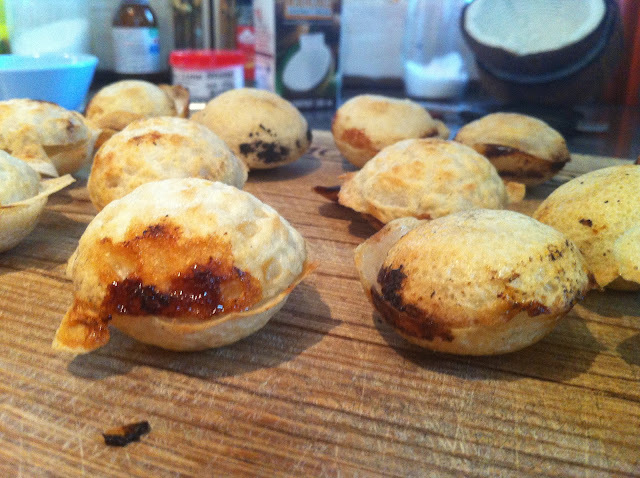 Let them cool for a minute or so as the filling will be molten and then eat them as fast as you can. I guarantee you it won't be that difficult! The credit for this recipe comes from a few places (mostly David Thompson) but I have made some of my own adjustments so if you actually use it to cook Kanom Krok I would really like to hear how they turn out, pictures would be even better! Good Luck! 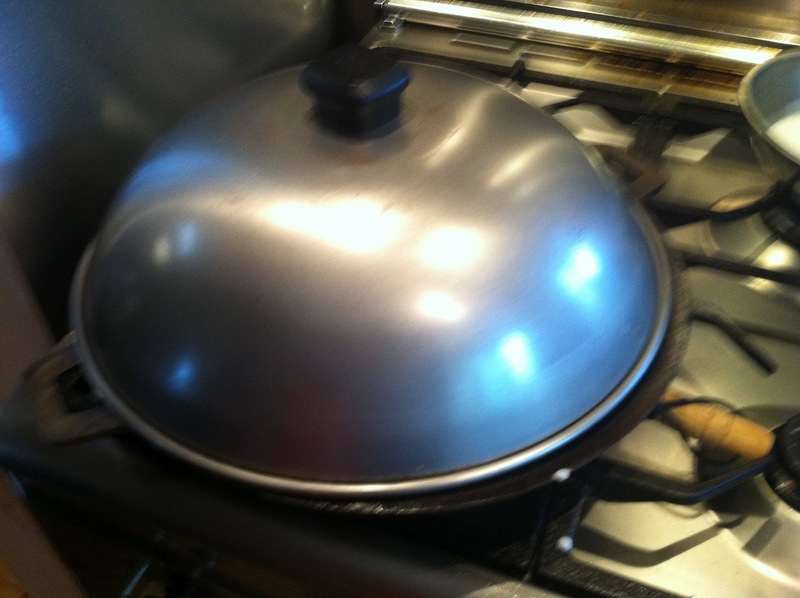 If you can't find a Kanom Krok pan (I got mine from Springvale), Waz from Nathan Thai in Footscray has told me he can order a 28 hole pan for $40 for aluminium and $35 for steel. Mine is cast metal which I assume is the steel one, I think cast metal is better than aluminium myself. Waz also has most of the ingredients you will need. Go to Footscray and check out his shop, he is very knowledgable and also very friendly.